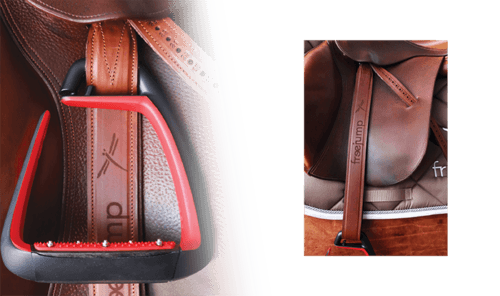 Following the creation of the Foxy boot, resulting from a collaboration with Pénélope Leprevost and the Italian designer Pininfarina, the new freejump stirrup – with an eye set parallel to the tread and a slightly reduced size – has been specially designed for women. The comfort, safety and technology of single-branch stirrups combined with the classicism of an eye set parallel to the tread for the first time. Improved shock-absorption ability. Reduces the strain on each stirrup by two-thirds and relieves pressure on the rider’s joints and the horse’s back, thanks to the branch’s new geometry. 3 times more cushioning than a traditional stirrup. Centre of gravity is set towards the front. This causes a backwards movement of the tread which encourages the rider to keep their heels down. Wide carbon tread, tilted studs: a supporting surface that is 12% bigger alleviates the pressure points on the arch of the foot. Development of the manufacturing process. The aircraft-grade spring steel branch, with very high mechanical strength, is 37% more resistant thanks to the new manufacturing technique. Flexible outer branch. The freejump single-branch technology allows a flexible outer branch to be used. Designed so that pressure from the foot opens it up if a rider is dragged along by their horse. 1. Open eye / suitable for use with freejump’s single-strap stirrup leathers. 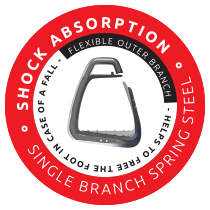 Our many years of experience and R&D of single-branch stirrups have allowed us to identify the maximum stress that a stirrup can withstand – from impact and from fatigue. Our overmoulded, single-branch stirrups made from steel (for the Soft’Up Pro and Soft’Up Classic stirrups) or from long-fibre polyamide (Soft’Up Lite stirrups) have been developed to respond to these levels of stress.Single-branch technology reduces the strain on each stirrup by two-thirds and relieves pressure on the rider’s joints and the horse’s back. 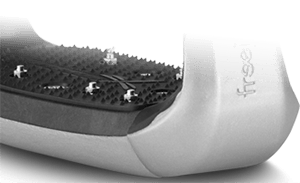 Designed to make it easier to release the foot in the event of a fall, the flexible outer branches open up under pressure from the foot. 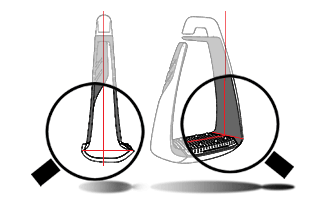 Studs: based on the technology used for downhill mountain biking pedals, the steel studs (for the Soft’Up Pro and Soft’Up Classic stirrups) or moulded studs (Soft’Up Lite stirrup) are designed to provide an extremely effective grip without causing wear to the soles. The stirrup’s eye, positioned further forward in comparison to the tread, means that the centre of gravity is offset – this encourages the rider to keep their heels down. This applies to all 3 stirrup designs (Soft’Up Pro, Soft’Up Classic and Soft’Up Lite).